Those of you who read my blog regularly will know that on October 7th 2017, my parents bought me a sewing machine as a combined birthday and Christmas present. I had wanted one for a while but at that point in time couldn’t afford it as we were saving up for our trip to the Emma Bridgewater factory and then Christmas. When I got my machine it was the first time I had touched a sewing machine since I was around 14/15 years old. I had no clue what I was doing. At this point I didn’t even know how to thread the needle or get the bobbin sorted. Since then I have watched countless YouTube videos, read numerous magazine articles, online articles and a book all based on sewing. I still have so much to learn but I am loving being able to make things when I am well enough to sit at the machine. It is something that completely absorbs me. I need to be able to concentrate on it or mistakes are made. It means whatever is going on in my life ( and at the moment it is quite upsetting as two very important people to me, are terminally ill) for the time I am at the machine I can just block it out and allow myself to breathe. 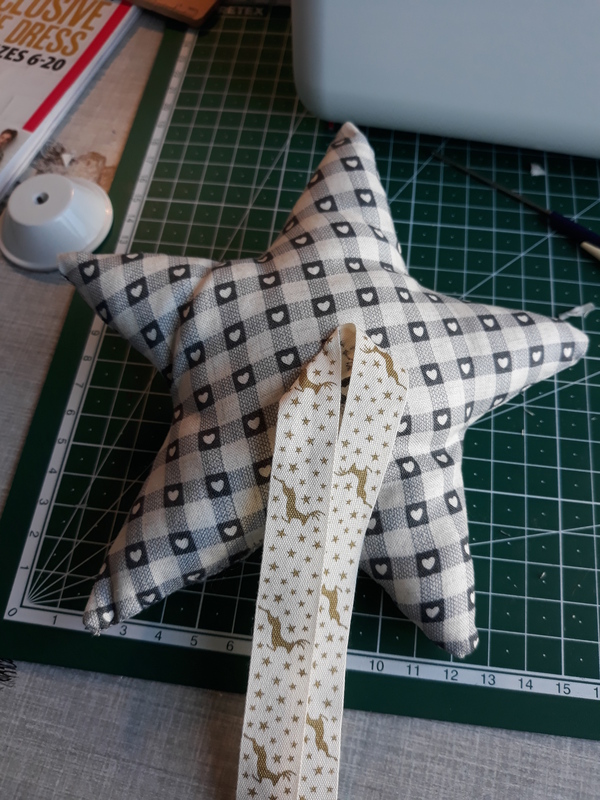 I realised at the end of November that our current star Christmas tree topper would no longer go (once the lounge has been redecorated) with the decor, so I decided to make myself one with some fabric I had bought to attempt some Christmas stockings with. 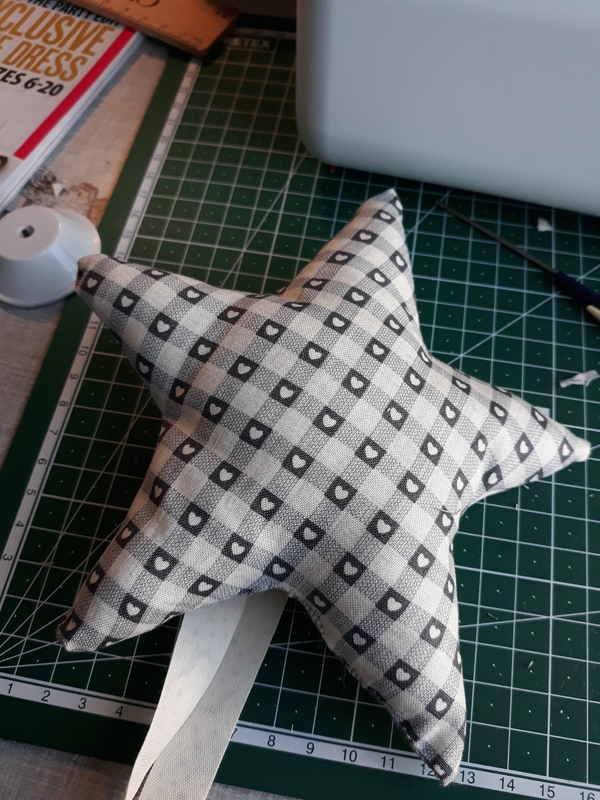 I didn’t have a pattern for the star so trawled the internet for a free printable template that I could print out. Due to dexterity issues with my hands I find pinning patterns to fabrics incredibly difficult. I can do it but it takes me hours, as the pattern slides on the fabric and have to continually move the pins around. To make my life easier I printed out my star template and then using a pritt stick stuck it onto a piece of cardboard. I then carefully cut out the star, once the glue had dried. 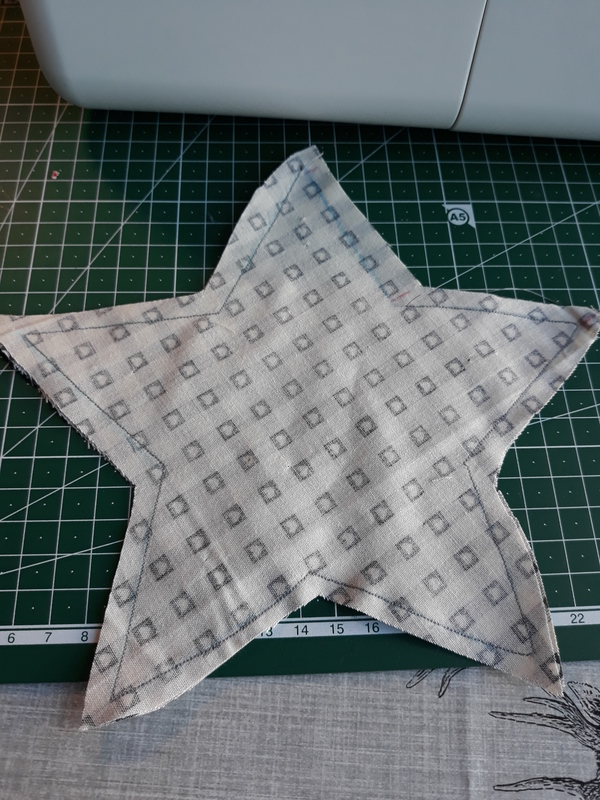 Using a fabric marker I simply held the cardboard star firmly down and drew around it. So much quicker and easier for me. First star topper completed front view. Reverse of first star topper with ribbon attached. 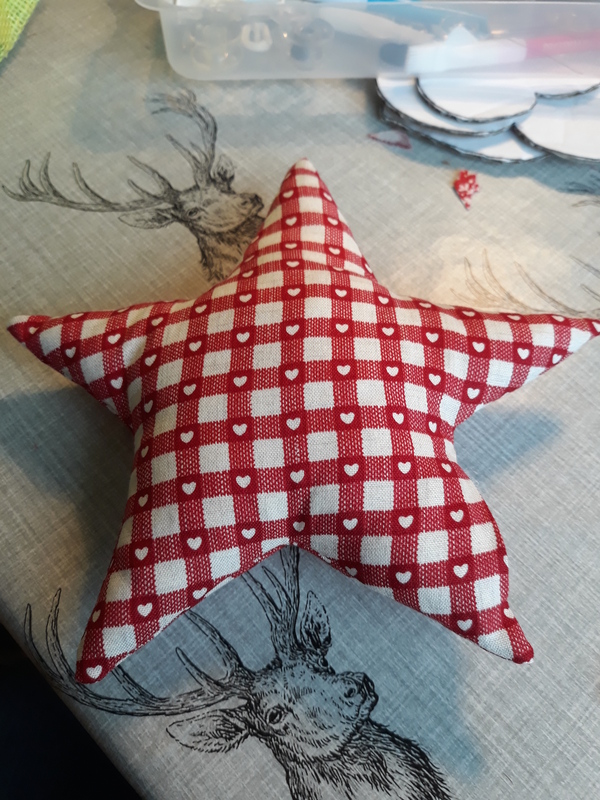 I made this star on the 25th November, I wasn’t happen with the quality of my own sewing getting the ribbon attached to the back of the star. So I decided at some point to make my life easier I would get myself a cheap glue gun, so that I wouldn’t need to attach the ribbon by hand sewing. I was so pleased with my efforts ( it was the first proper thing I had made that I was going to use. Everything up until that point had been prototypes or practicing) I posted a photo on Instagram. Within a few hours a friend of my sister-in-law contacted me and asked if I would make her a star as well. The following day I made her a star and ordered myself a hot glue gun so I could attach the ribbon to hers neatly. When I made Sarah’s star I decided I would make myself another star, so I could have one on my dresser and one on my Christmas tree. I did however advertise the star on Facebook amongst my friends but had no takers. I didn’t think anything of it, after all I had only just begun to start sewing and maybe other people didn’t think they were good enough. That was on the Tuesday on Saturday evening another friend contacted me to ask if I had sold the other star. I explained I hadn’t but I also let her know I had the same fabric but in red and did she perhaps want her star made out of that. I was lucky, she did, I say lucky as at this point the star I had advertised was tied to the top of my christmas tree and the other was tied to my dresser. 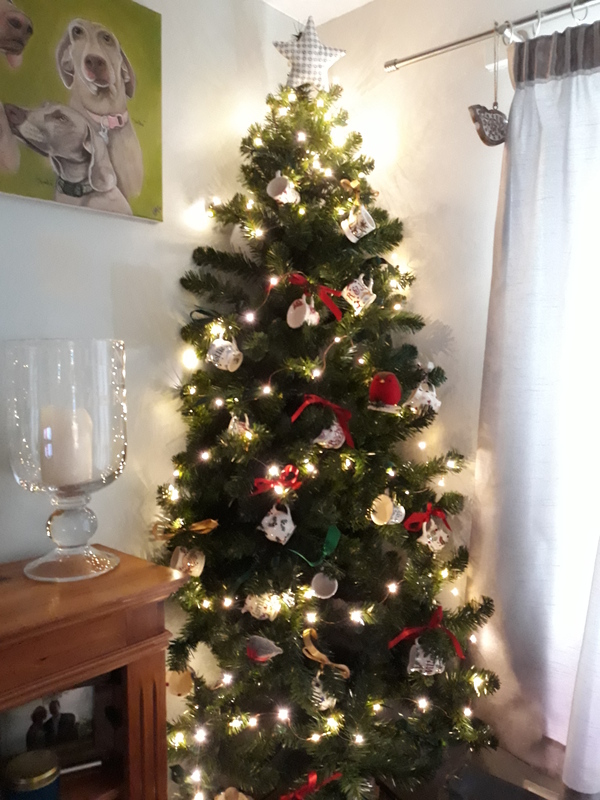 Our Christmas tree with my star topper. 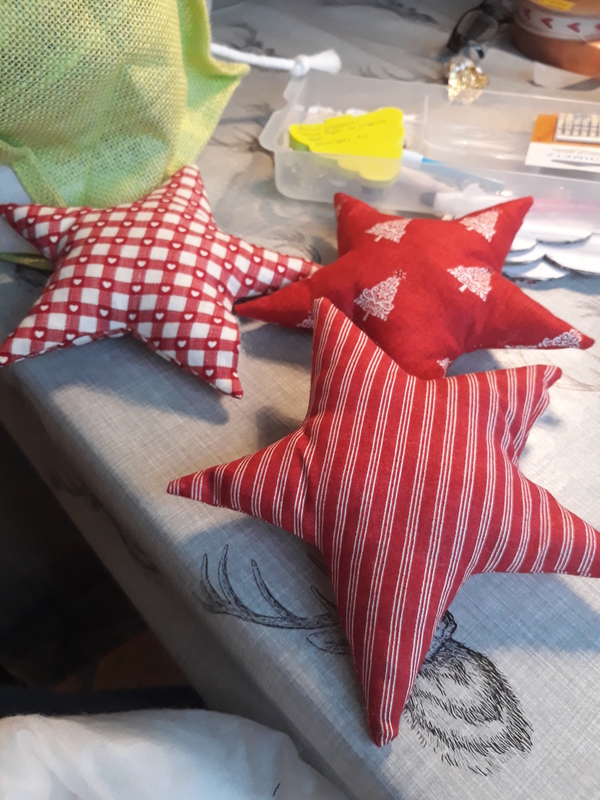 On Sunday I got started early, I decided I would make six stars in total (including Kerri’s) and then once they were made I would advertise them on Facebook again. 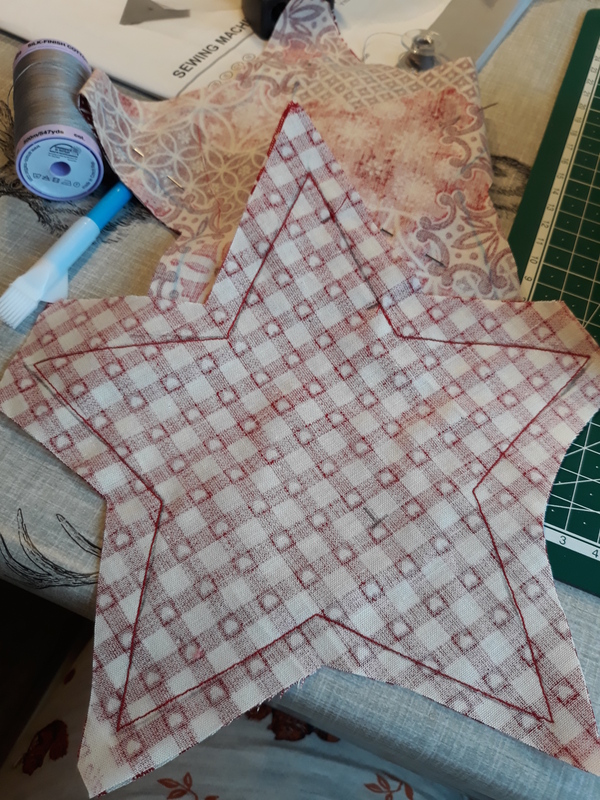 I thought as the first star had taken 4 days to sell, I would have a week or more’s grace before I would need to make any more stars. That way I wouldn’t feel under pressure and lose the enjoyment of making them. I didn’t want it to feel like a job or to start stressing me out because I had enough stress already. All the stars cut out and waiting to be sewn. All the stars pressed and turned the correct way around. Before I posted the last photo on Facebook, hubby rang me, he was visiting his parents and had told them about the stars I was making. They asked if I would make them one, which as I was already making 6, I had a choice out of the five unsold ones. However as soon as I posted the photo of the stars all pressed and turned around the right way, within about 40 minutes I had sold another three, all to one lovely lady. Then about 30 minutes after that I had sold the last one. I was giddy as a goat, never in my wildest dreams did I think for a minute that I was going to sell them all on Sunday. The extras that I had made were supposed to be stock that I could just send out. I couldn’t get my head around the fact that people wanted to buy what I was making. Kerri’s star stuffed waiting to be finished. 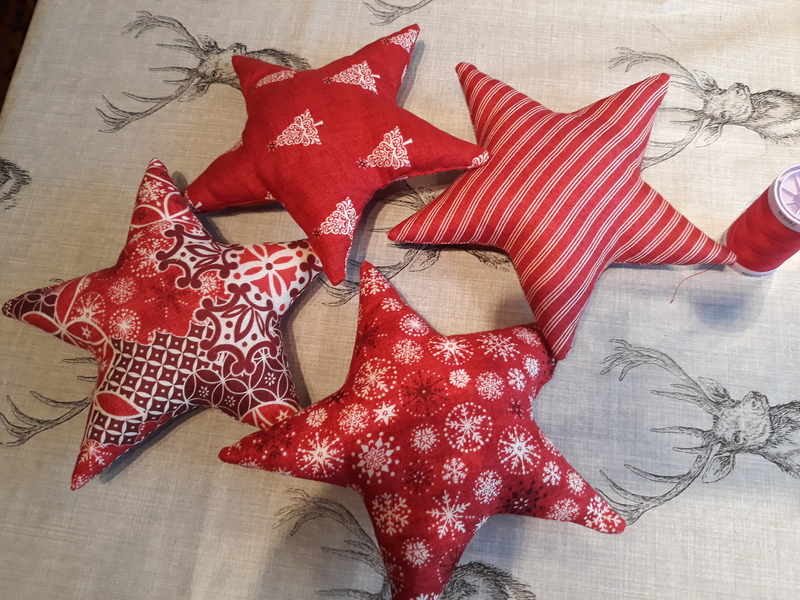 A few hours later and I had two pre-orders for stars that hadn’t been made yet. I had to let them know that I would be making them during the week and would show them the stars once made so that they could choose the design that they liked. Thankfully the majority of my friends on Facebook either know that my health is poor or are poorly themselves and appreciate I will work as quickly as I can but I won’t jeopardise my health. I can only work when my pain levels are on the low side and the brain fog isn’t too bad. Which means it has to be done in very short bursts, with lots of built-in rest periods. Later that day I posted a photo of some stars that were almost completed. I explained that all the stars I had made / was in the process of making had been sold and that I hoped to make some more over the next week and I would post a photo when I had completed them. At 8.30pm that night I had another pre-order and then the following morning another. Then whilst writing this blog post I have had another two! 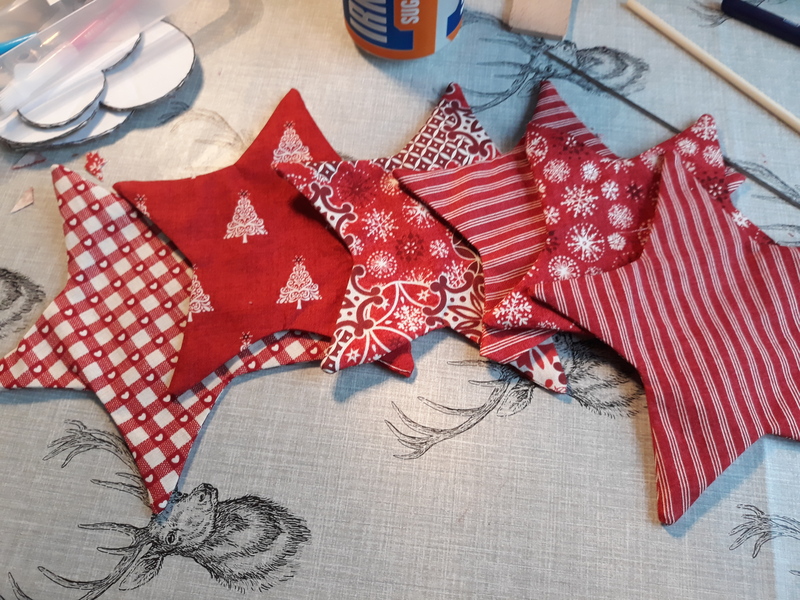 Finished stars waiting for ribbons to be attached. I am still in shock at how well the Christmas Tree Topper’s or dresser stars have sold. When I got my sewing machine in October I had said that I hoped to be selling some items by the following year. I thought it would take me a good 12 months to get good enough to sell stuff, obviously I got that wrong. It has made me feel unbelievably happy, I haven’t earned any money since being ill-health retired. I collect a pension from my previous employers but I haven’t worked since then. I had forgotten what it feels like to produce a piece of work and have people want it. It has helped my mental health no end and because of the concentration levels involved I am sleeping better. Which in turn helps reduce my overall pain levels. 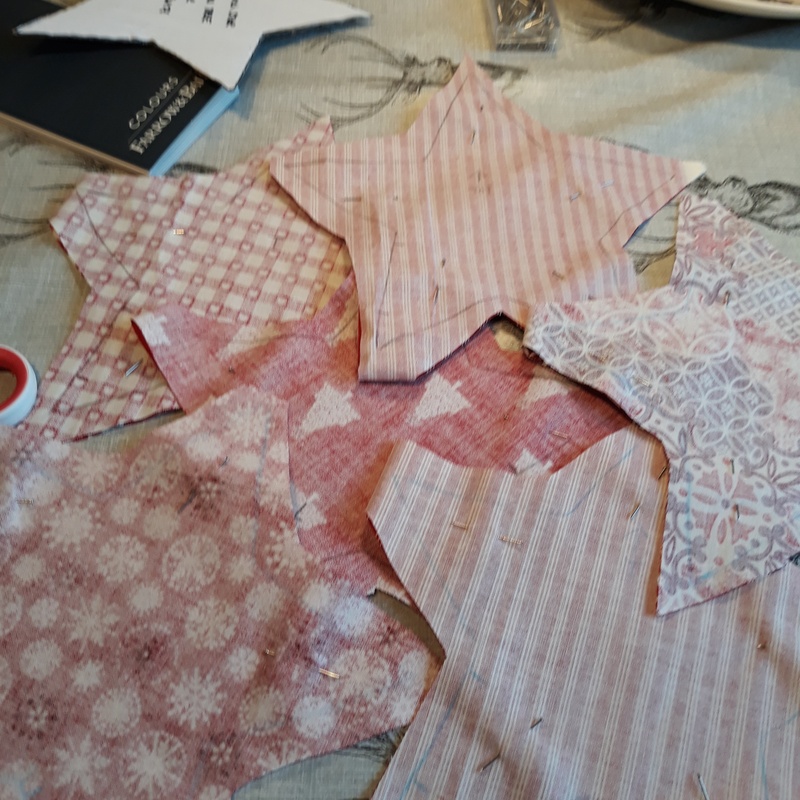 So constantly at the moment I am seeing stars in all sorts of fabrics!